Auguste François Bonheur (1824-1884) was born in Bordeaux where he was trained along with his sister Rosa (1822-1899) by his father Raymond Bonheur (died 1849). He exhibited at the Salon in Paris and at the Royal Academy in London between 1857 and 1874. This painting is a fine example of Bonheur's oeuvre and of 19th-century Realist paintings which favours the depiction of rural subject matters resulting from the direct observation of nature. This trend emerged in France in the 1840s in the works of Gustave Courbet (1819-1877) and Jean-François Millet (1814-1875). The present scene was probably inspired by the scenery around the Scottish lakes Bonheur visited during in the 1860s. 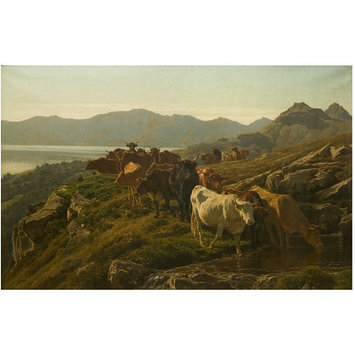 Highland scene with cattle walking down the top of a cliff; a lake on the left middle distance and mountains in the background under a sunset light. Historical significance: This painting is a fine example of Bonheur's landscape paintings, often enlivened with cattle. 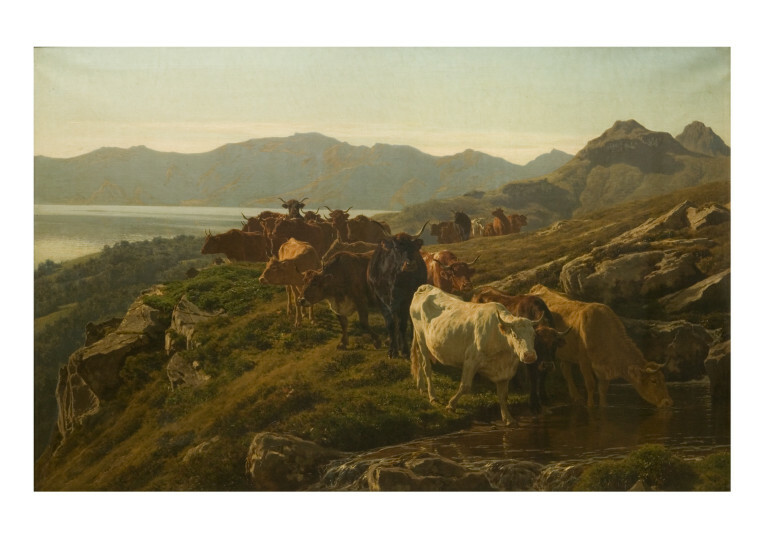 The highland depicted here was probably inspired by the Scottish lakes Bonheur visited in the 1860s. 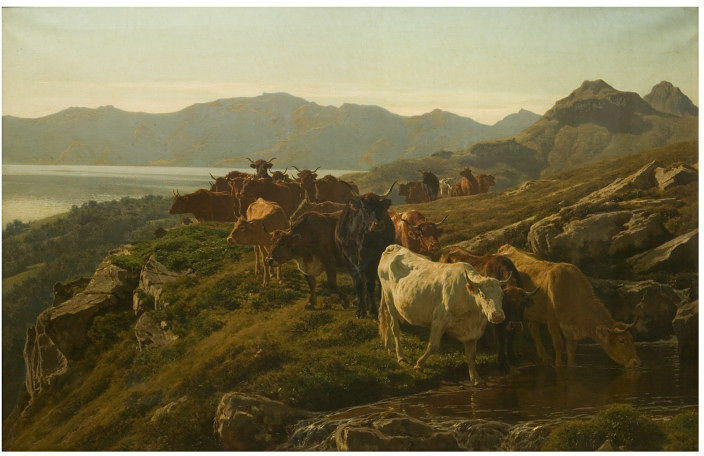 Typical of the Realist movement emerged in the 1840s in France is the interest in rural society and the rendering of light, here the sunset light subtly reflecting on the cows' massive bodies. The subject matter is reminiscent of 17th-century Dutch paintings such as Karel Dujardin's œuvre (c. 1622-1678) but also results from the revived interest in direct observation of nature. It was nevertheless probably also bolstered by his sister's success in this field. Bonheur's refined and detailed brushwork differs somehow from the broad manner developed by the Barbizon painters. Bonheur specialised in the depiction of cattle set in landscapes and similar works include Le retour de la foire, Musée des Beaux-Arts, Bordeaux while a similar pastoral scene was sold at Christie's New-York 19 April 2006, lot 204. Such landscape paintings were particularly fashionable during the 19th century and some pre-Raphaelites painters such as William Holman Hunt also produced similar works, notably Our English Coasts, 1852, in the Tate Britain, London. Kauffmann, C.M., Catalogue of Foreign Paintings, II. 1800-1900, London: Victoria and Albert Museum, 1973, p. 12, cat. no. 33. Shaw Sparrow, W., 'The Dixon Bequest at Bethnal Green' in Magazine of Art, XV, 1892, p. 158, repr.